The border between the Dominican Republic and Haiti is closed due to the fear the Cholera will spread. Hurricane Tomas performed a spectaculor 90 degree turn north and blew across, complicating matters even further. The situation is Haiti is dire indeed! 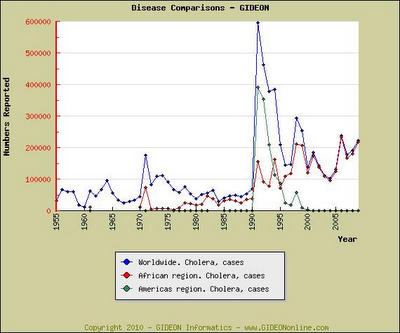 For a global perspective on cholera, a potentially fatal infectious disease, one of the best sources is the GIDEON online database ($). I have included on this blog post the link to the freely accessible GIDEON blog and a recent posting on the global statistics for this disease. PAHO urges countries to ramp up Cholera readiness. The American Medical Association (AMA) has adopted a new offical policy to guide medical students and practicing physicians in the appropriate use of the various social media tools. This policy has arisen from the need to ensure the accuracy of information, maintain appropriate boundaries, as well as safeguard personal information and confidentiality in all online communications. 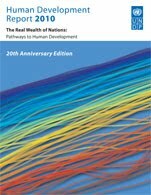 UNDP’s 20th anniversary Human Development Report entitled “The Real Wealth of Nations: Pathways to Human Development” launched today [November 4, 2010] at the United Nations. "The past 20 years have seen substantial progress in many aspects of human development. Most people today are healthier, live longer, are more educated and have more access to goods and services. Even in countries facing adverse economic conditions, people’s health and education have greatly improved."